The New York State Fair runs from Wednesday, August 22nd until Monday, September 3rd, 2018. 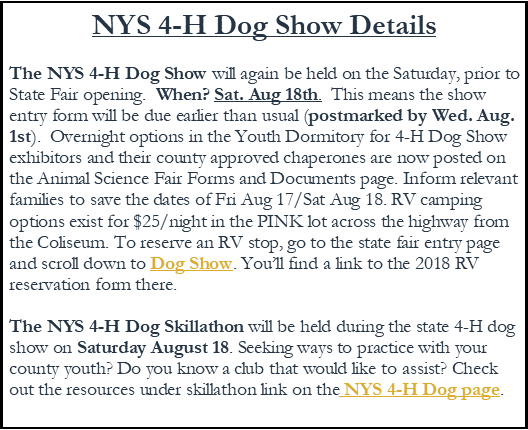 Forms and information will be available here for Cayuga County 4-H youth to sign up and participate in activities. State Fair Selection: State Fair Selection is made based on the youth’s ribbon accomplishments, the animal show judge and consultation with the 4-H staff. Not all classes are eligible for State Fair judging. Each animal species has its own requirements and participation restriction. Cloverbud youth are not eligible to participate in Youth Shows of the State Fair. State Fair participation is a privilege. The selected exhibits represent outstanding work and skills development for that age and experience level. Participation in Cayuga County 4-H Youth Fair or Horse Show is required in order to be considered for State Fair selection, unless otherwise approved by 4-H staff. Youth selected for State Fair Exhibition will be notified as soon as possible following their show event. As information becomes available, it will be posted. Cayuga County 4-H rotation in the Youth Building will be Monday, August 27th thru Thursday, August 30th. Become a Teen Leader! • State Fair Teen Leaders are 4-H Youth that are at least 13 years old that would like to take the next step in leadership and responsibility. Teen Leaders have a job that they do during the 4-day rotation that Cayuga County is in the Youth building, and get a premium for their work. Teen Leaders are expected to be prompt, prepared, polite, flexible and responsible. Teen leaders often interact with others, and are an example for 4-H members state-wide. Teen Leaders have the opportunity to stay at the State Fair in the dormitories during Cayuga County’s rotation, at a very low cost. The application to be a teen leader is available here! For more information click here or contact the office at 315-255-1183. As always, we will try and have any updated information on the CCE Cayuga County website. Additional information about State Fair will also be made available as the date draws closer, and at the State Fair information meeting – the date will be announced shortly.